The workspaces we see in Circuit Cellar are fascinating. The engineers who open up their rooms, garages, and cellar’s normally have a lot of equipment and sufficient access to components and facilities. But what about an Indian university student’s workspace? Wisse Hettinga recently visited with Nishant Mittal, a student at the Indian Institute of Technology (IIT Bombay). Mittal discussed his small workspace space in his dorm room, as well as his plans for the future. 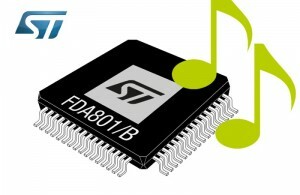 STMicroelectronics recently announced its second-generation digital audio amplifiers with internal 24-bit DAC conversion. The FDA801 and FDA801B four-channel class-D components are intended to simplify system design and lower cost for car-radio suppliers. Offering 40% power savings compared to standard class-D amplifiers, the new FDA801 and FDA801B four-channel class-D amplifiers with digital input convert the digital audio source directly into high-quality, cabin-filling sound. The digital input gives immunity to GSM noise, improves sound quality, saves component costs, and simplifies system design. STMicro’s new power amplifiers combine superior audio quality and increased energy efficiency, as well as the unique real-time measurement of speaker impedance via the Digital Impedance Meter (FDA801B). The amplifiers are rated with 115-dB signal-to-noise ratio (SNR) and 110-dB dynamic range. The simplified digital input eliminates external DAC and external decoupling capacitor. The built-in Digital Impedance Meter (DIM, in FDA801B) automatically recognizes the connected speaker’s magnitude and phase and communicates it by digital bus (I2C). The FDA801 and FDA801B are now available in the LQFP64 Exposed Pad Up package. Antenova recently released two new modules for GPS and GNSS. The M10578-A2 and M10578-A3 provide an easy drop-in receiver solution, which is a useful way to add location capability to very small consumer devices. The modules—based on the MediaTek processor—both measure 9 × 9 × 1.8 mm with low current consumption, which makes them suitable for smaller portable devices, such as smart watches, navigation devices, OBD II modules, asset tracking, personal safety, and sports cameras. The M10578-A2 module operates with GPS, with a 1-to-5-Hz update rate. 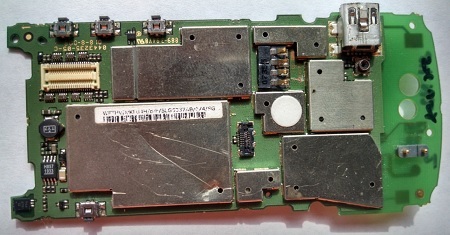 The M10578-A3 operates with GPS, GLONASS, BEIDOU, and Gallileo with an update rate of 1 to 10 Hz. Included is internal self-generated orbit prediction that uses two GNSS systems simultaneously to give a faster time to fix and a second high-quality low noise amplifier (LNA) to boost low powered satellite signals. Both modules are pin compatible. As for the antenna function, Antenova offers the small Sinica SR4G008 GNSS antenna. 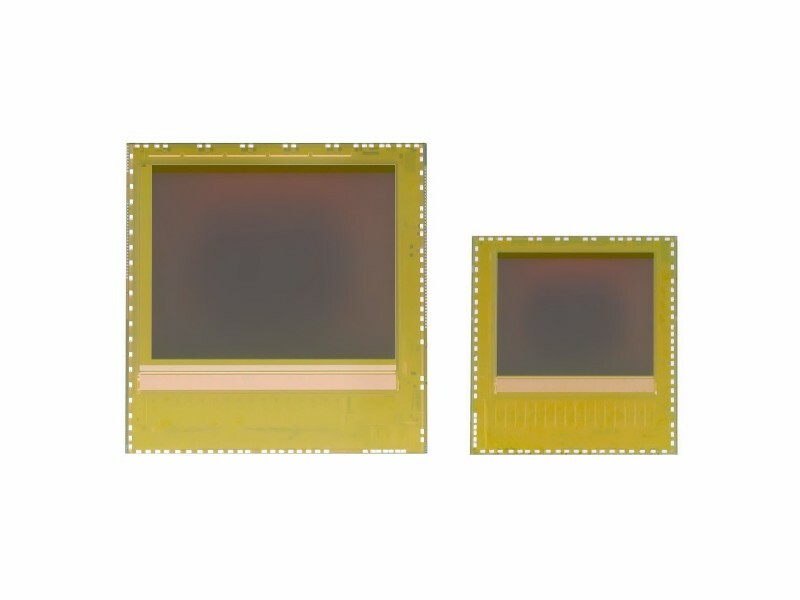 Built on high-grade FR4 substrates with a high density, the modules’ multilayered design places the critical RF functions in the best position for location finding and performance. 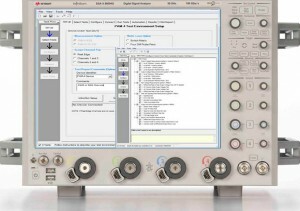 Keysight Technologies recently announced new measurement application software for quickly and accurately measuring and quantifying pulse amplitude modulation with four amplitude levels (PAM-4) signals. The software is used with the Keysight S-Series, 90000A, V-Series, 90000 X- and Z-Series real-time oscilloscope platforms and the 86100D DCA-X Infiniium sampling oscilloscope. The new Keysight N8836A PAM-4 analysis software (for S-Series, 90000A, V-Series, 90000 X- and Z-Series oscilloscopes) and the new N1085A PAM-4 analysis software (for 86100D oscilloscopes) provide comprehensive characterization of electrical PAM-4 signals based on the Optical Internetworking Forum’s Common Electrical Interface (OIF-CEI 4.0) proposed 56G interfaces, and the IEEE 400 Gigabit Ethernet (P802.3bs) standard. The N8836A and N1085A PAM-4 measurement applications for S-Series, 90000A, V-Series, 90000 X- and Z-Series real-time oscilloscopes and 86100D DCA-X Series sampling oscilloscopes deliver measurements such as: linearity and output voltage measurements including level separation mismatch ratio (RLM); eye width (EW) and eye height (EH); jitter measurements including even-odd jitter and clock random jitter; and differential and common mode return losses performed using a Keysight time domain reflectometer (TDR) or VNA. The N8836A and N1085A software applications cost $2,500 each. 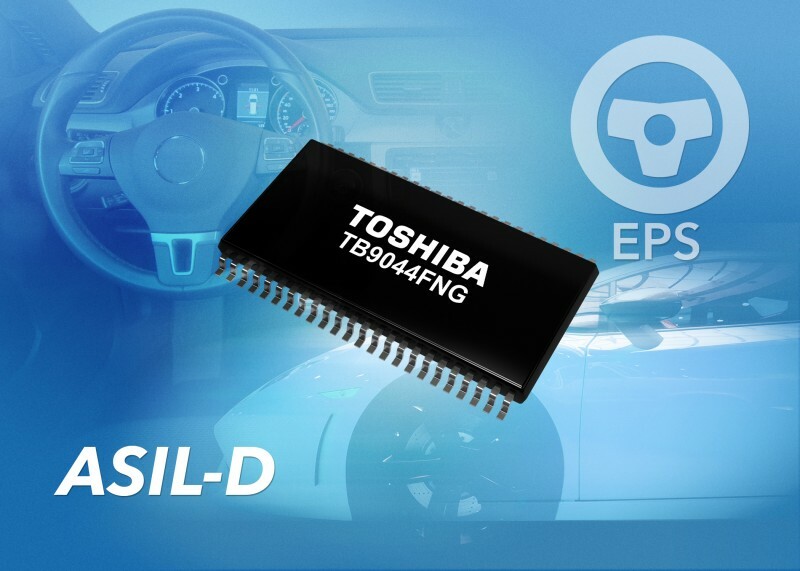 Toshiba Electronics Europe recently announced a general-purpose system power IC with multiple outputs and functional safety circuits for automotive applications. The TB9044FNG comes in an HTSSOP48-P-300-0.50 package measuring 6.1 mm × 12.5 mm × 1 mm. It integrates various failure-detection functions (e.g., a high-voltage and low-voltage detection and overheat detection) and a watchdog timer to monitor the failure detection of the external microcontroller. Also included is an initial diagnosis circuit to detect latent faults in the failure detection circuits to secure higher functional safety. The IC generates a 6-V output from a high-efficiency buck-boost DC-DC converter. In order to avoid problems following a voltage drop during cranking, the low-side operating voltage range is improved down to 2.7 V (minimum) with battery operation. In addition, the IC incorporates four series power supply output circuits receiving the 6-V input generated by the DC-DC converter. It also incorporates an output circuit with a 5-V constant voltage (current capacity of 400 mA) for the microcomputer, and three circuits with 5-V constant voltage output (current capacity of 100 mA) for sensors and other interfaces. Each can output a voltage independently. Samples are now available. Mass production scheduled to begin in October 2017. Microchip Technology’s new MPLAB Harmony Ecosystem Program is for the developers of embedded middleware and operating systems who are seeking to unlock the business potential of the 32-bit PIC32 microcontroller customer base. Ecosystem partners also gain early and easy access to the complete and current set of MPLAB Harmony tools. MPLAB Harmony is a 32-bit microcontroller firmware development framework, which integrates licensing, resale, and support of both Microchip and third-party middleware, drivers, libraries, and RTOSes. The new Ecosystem Program builds on that framework by offering an open and structured method to become certified as “Harmony Compatible,” using the embedded-control industry’s only set of test harnesses, checklists, and reference validation points. By accessing this broader, code-compatible ecosystem when creating complimentary value-added software, developers can reduce risks and overall costs, accelerate time to market, and grow their businesses by gaining opportunities to market to thousands of PIC32 MPLAB Harmony users. As today’s applications get increasingly sophisticated, embedded developers need to rapidly bring complex solutions to market. 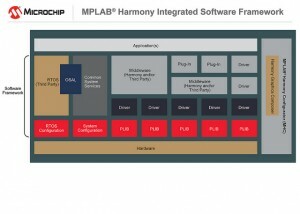 Microchip’s MPLAB Harmony framework for its PIC32 microcontrollers can reduce the development time of a typical project by a minimum of 20–35%, by providing a single integrated, abstracted, and flexible source of tested, debugged, and interoperable code. Additionally, MPLAB Harmony provides a modular architecture that enables the efficient integration of multiple drivers, middleware and libraries, while offering an RTOS-independent environment. Not only does this pre-verification and integration speed development, it also increases reuse. On the hardware side, the MPLAB Harmony framework makes it even easier to port code, thereby simplifying migration among all of Microchip’s 32-bit PIC32 microcontrollers, enabling a highly profitable, multitiered end equipment offering with minimal code redevelopment. Middleware and Operating System developers who take advantage of Microchip’s Ecosystem Development Program will be better able to offer customers solutions that leverage MPLAB Harmony’s efficiency and reliability advantages. 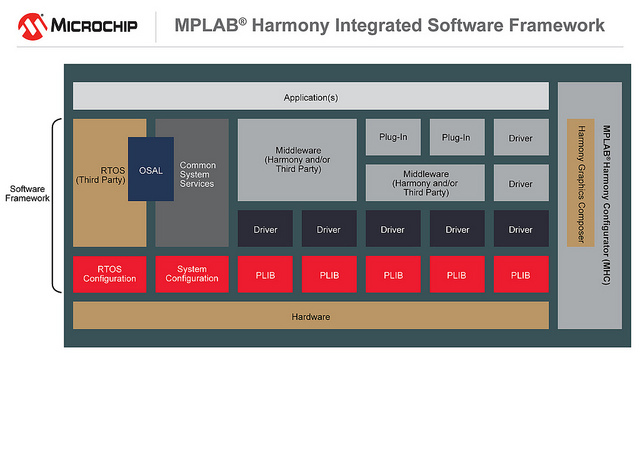 The MPLAB Harmony Integrated Software Framework is also supported by Microchip’s free MPLAB Harmony Configurator and MPLAB XC32 Compiler v1.40, all of which operate within Microchip’s MPLAB X IDE, and all of which are available for free download. Additionally, MPLAB Harmony and the PIC32 are supported with a comprehensive set of low-cost development boards available from microchipDIRECT or by contacting one of Microchip’s authorized distribution partners. 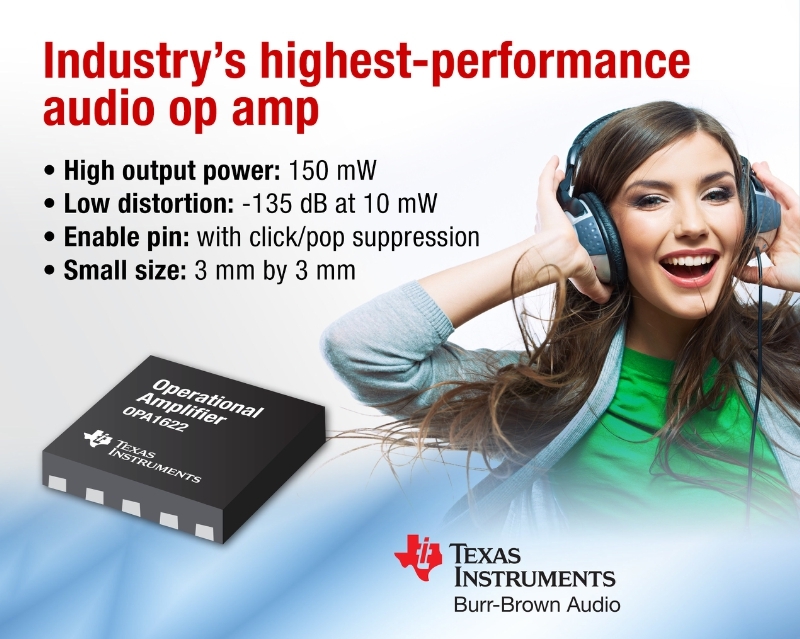 Texas Instruments recently introduced the OPA1622 audio operational amplifier (op-amp), which is the latest addition to the company’s Burr-Brown Audio line. The OPA1622 delivers high output power of up to 150 mW and extremely low distortion of –135 dB at 10 mW. The compact OPA1622’s low power consumption and low distortion can deliver high-fidelity audio in portable devices such as headphone amplifiers and smartphones. Headphone amplifier designers can take advantage of its low total harmonic distortion (THD) of –135 dB at 10-mW output power into a 32-Ω load. In addition, the OPA1622 delivers maximum output power of up to 150 mW before clipping while maintaining the lowest THD and noise (THD+N), providing a clean signal path for pro audio applications. 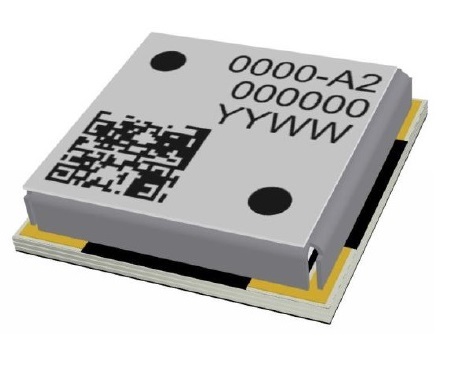 The OPA1622 consumes low quiescent current of 2.6-mA per channel and delivers high linear output current of 80 mARMS in a 3-mm × 3-mm DFN package. Additionally, the increased power-supply rejection ratio (PSRR) of –97/–123 dB at 20 kHz enables low distortion from switching power supplies with no LDO, thereby saving board space without compromising audio performance. The OPA1622’s ground-referenced enable pin is directly controllable from the low-power GPIO pins without level-shifting circuits. Its pinout improves PCB layout and enables exceptional distortion performance at high output power. An enable-circuitry design limits output transients when the OPA1622 is transitioning into or out of shutdown mode, effectively eliminating audible clicks and pops. A TINA-TI SPICE macromodel is available for the OPA1622 to help verify board-level signal-integrity requirements. The OPA1622 is available in a 3-mm × 3-mm DFN package $2.90 in 1,000-unit quantities. IAR Systems recently announced a new version of IAR Embedded Workbench for Renesas RL78. The new version features new functionality and increased code quality control for applications based on Renesas RL78 microcontrollers. C-STAT—which features innovative analysis that can detect defects, bugs, and security vulnerabilities—is now supported. Static analysis enables you to find identify errors (e.g., memory leaks, access violations, arithmetic errors, etc.) early on. Also included is stack usage analysis. You can customize the analysis process to handle account constructs such as calls via function pointers and recursion. 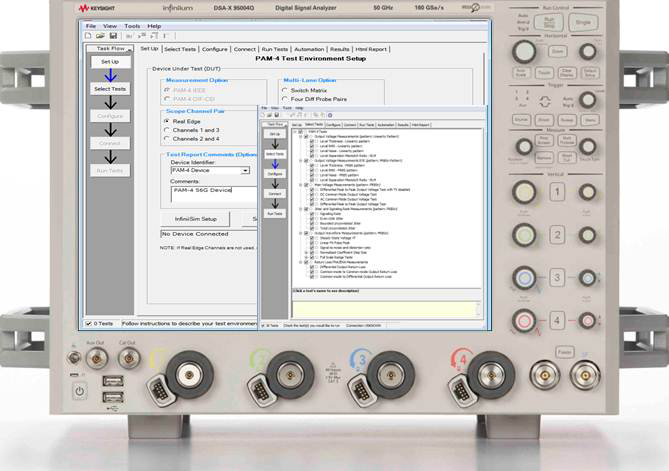 Moreover, IAR Embedded Workbench for RL78 includes code optimizations for fast, efficient code. Included with the toolchain is Renesas AP4 for RL78. You can use the standalone tool (formerly named Applilet) to automatically generate control programs for peripheral modules in accordance with user-defined settings. Renesas AP4 for RL78 supports code generation for IAR Embedded Workbench for RL78, and the generated modules are incorporated via the IAR Project Connection mechanism. IAR Embedded Workbench for RL78 includes the IAR C/C++ Compiler, assembler, linker, library tools and the C-SPY Debugger in an easy-to-use IDE. It is available in several editions, including a Functional Safety version. Infineon Technologies AG and pmdtechnologies gmbh recently announced the development of REAL3 3-D image sensor chips for virtual and augmented reality applications, spatial measurement, photo effects, and more. The new sensors have improved optical sensitivity and power comsumption in comparison to the previous version. Specifically designed for mobile devices, where most applications only need a resolution of 38,000 pixels. The IRS1125C will be available in volume as of first quarter of 2016. The IRS1645C and IRS1615C are slated for the second quarter of 2016. 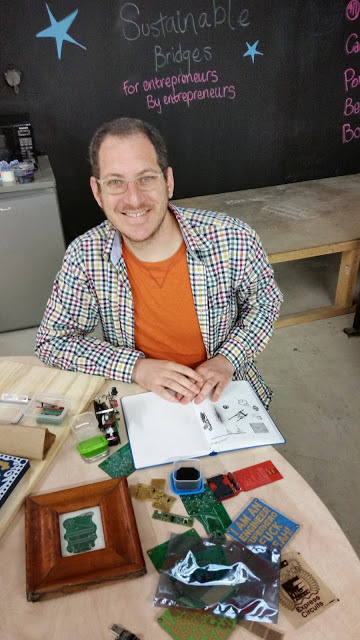 Saar Drimer (PhD, Cambridge) runs Boldport, a London-based hardware and prototyping consultancy that specializes in circuit boards. Wisse Hettinga recently met with Drimer to discuss PCB design, electronics craftsmanship, and his various engineering projects. The Art of Electronics is a book that’s well-known by many electronic engineers all over the world. Written by Horowitz and Hill, the first edition was published in 1980 and recently, in 2015, a third edition was released. Over the past 35 years, the book has been an inspiration and resource for many engineers eager to learn about the art of designing with electronics. But there is also a real art of electronics. To discover what that is, I traveled to London to meet up with Saar Drimer. His workplace was in one of the characteristic arches underneath London Bridge Station. With the constant rumble of the trains arriving and pulling out of the station in the background, he showed me some of his work. Drimer’s designs are completely different from what we usually see on PCBs. Where most of our designs end up as small rectangles with only a few holes for the assembly screws, his boards take different shapes. Some are swirly, sometimes animal-like. At other times, he integrates components right into the board in special holes, as you can see in his Tiny Engineer Superhero Emergency Kit. Often there is no straight copper line to be found; they go all over the place and are a vital part of the total design. A PCB designed by Drimer asks for exposure and can be interesting for art’s sake only, but also for marketing purposes where drawing attention and presenting a surprise is required. One of his designs even features in the women’s magazine Marie Claire! Where many of us try to put all the PCB and wiring in a (mostly) gray box and leave it out of sight, Drimer is doing exactly the opposite: he is trying to expose it. His end product is the PCB and that is where his art comes into the picture—in many exciting formats. In many ways, Saar is an engineer like many of us. He is extremely knowledgeable about electronics and designing. But when it comes to the latter, he is using unorthodox methods. Where we start with the schematics, Drimer starts with the form and shape of the final PCB—basically, he designs the other way around! Working and designing in the opposite direction is not easy with existing PCB CAD programs like Eagle or Altium. They all start with a schematic and are using component libraries routing the final layout in the most effective or smallest footprint PCB. Their rigid, straightforward approach is excellent when designing for just another rectangle PCB. But if you want new and creative designs, you need to think of a different way of working and using other tools. If you want to change the way of thinking and designing, you need to be able to use free forms and the routing cannot be left to the CAD program. And that is exactly what Drimer is doing. To be able to start with a different type of design, Drimer was left with no choice but to start developing his own PCB CAD design program. Unlike most of us who call ourselves “engineer,” Drimer calls himself ”craftsman”—and as a true craftsmen, he makes his own tools. 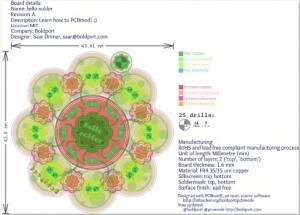 PCBmodE is Drimer’s custom PCB CAD program. The “mod” in PCBmodE has a double meaning, Drimer explained. “The first is short for ‘modern’ in contrast to tired, old EDA tools. The second is a play on the familiar ‘modifications,’ or ‘mods,’ done to imperfect PCBs. Call it ‘PCB mode’ or ‘PCB mod E’, whichever you prefer,” he said. 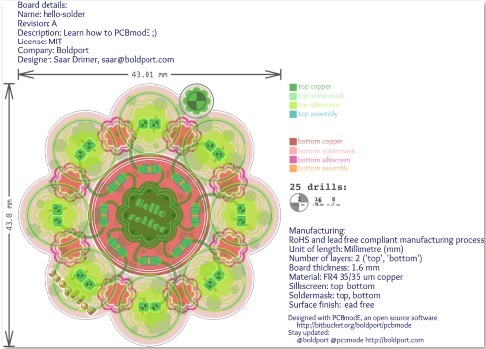 PCBmodE is a PCB design Python script that creates an SVG from JSON input files. It then creates Gerber (the standard software to describe the PCB images: copper layers, soldering mask, legend, etc.) and Excellon files for manufacturing. With no graphical interface, PCBmodE enables you to place any arbitrary shape on any layer because it is natively vector-based. Most of the design is done in a text editor with viewing and some editing (routing) completed with Inkscape. (Inkscape is a professional vector graphics editor for Windows, Mac OS X, and Linux. It’s free and open source.) On his website, Drimer explains how to work with the program. “PCBmodE was originally conceived as a tool that enables the designer to precisely define and position design elements in a text file, and not through a GUI. For practical reasons, PCBmodE does not have a GUI of its own, and uses an unmodified Inkscape for visual representation and some editing that cannot practically be done textually,” said Drimer. If you want to give PCBmodE a try, simply download it at www.pcbmode.com. It works with Linux, but Drimer is interested in results on other OS platforms as well. For starters, a “hello solder” design is currently available. Examples of Drimer’s work are posted on his website, www.boldport.com. 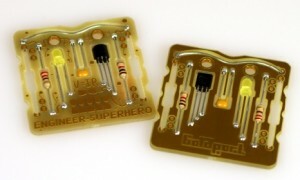 I especially like the Tiny Engineer Superhero Emergency Kit’ design where the components are integrated into the PCB itself resulting in a very flat design. You will also notice he is not using straight lines and angles for the traces. It is more of a pencil drawing; the traces flow along the lines of the PCB and components. You might ask why on earth someone would put so much effort into all of this? Don’t ask! But, if you like, here are a few answers. First, because it is an art. Second, it is Drimer’s full-time job and he hopes to expand the business. And third, working differently from the norm tends to generate fresh ideas and exciting solutions—and that is what we need more of. This article appears in Circuit Cellar 306 (January 2016). 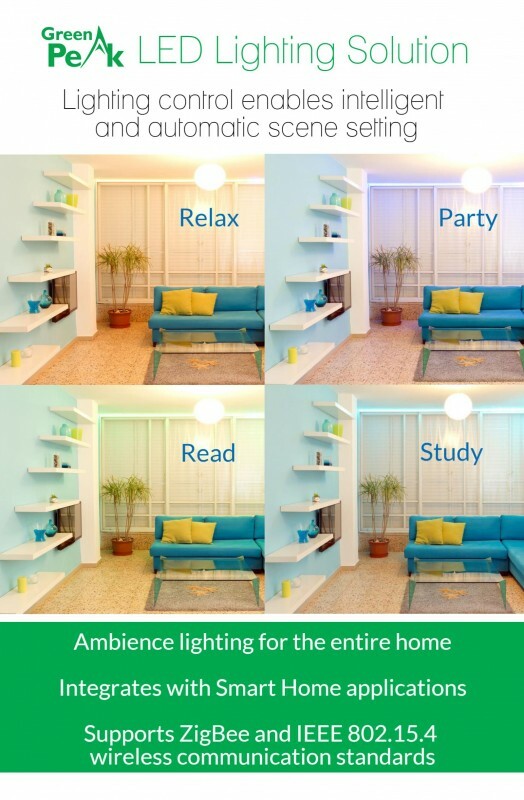 GreenPeak Technologies recently launched a wireless low-cost ambient lighting application based on the new GreenPeak GP651 communication chip that can support various ZigBee and IEEE 802.15.4 communication protocols. The solution can combine LED lights with smart ambient applications to provide you with the freedom to create a variety of lighting scenes. 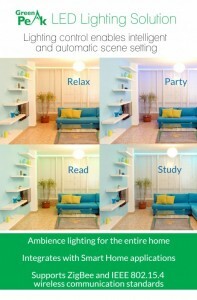 The solution supports one- , two-, and four-channel LED bulbs. You can control settings and time schedules via a Smart Home system, a smart phone, or a basic wireless switch. The GP651 is a low-cost, small footprint (QFN32), single-chip solution. Additional cost savings can be achieved because of its 125°C (257°F) spec, reducing the size of a heatsink, enabling a compact and creative product design, and reducing the complexity of manufacturing resulting in a low total BOM. Silicon Labs recently introduced two new EFM32 Gecko microcontroller (MCU) families that feature advanced security and energy-management technologies. The Jade Gecko and Pearl Gecko MCUs combine a hardware cryptography engine, flexible low-energy modes, an on-chip DC-DC converter, and scalable memory options backed by Silicon Labs’s Simplicity Studio tools. The MCUs target an array of energy-sensitive and battery-powered devices, such as wearables and IoT node applications. Jade and Pearl Gecko MCUs are meant to equip IoT-connected devices with the latest security technologies to thwart hackers. They feature a hardware cryptography engine providing fast, energy-efficient, autonomous encryption and decryption for Internet security protocols (e.g., TLS/SSL) with minimal CPU intervention. The on-chip crypto-accelerator supports advanced algorithms such as AES with 128- or 256-bit keys, elliptical curve cryptography (ECC), SHA-1, and SHA-224/256. Hardware cryptography enables developers to meet evolving IoT security requirements more efficiently than with conventional software-only techniques often required by competing MCUs. Based respectively on ARM Cortex-M3 and M4 cores, Jade and Pearl Gecko MCUs provide ample performance for connected devices while enabling developers to optimize battery life or use smaller batteries for space-constrained designs. The new MCUs feature an enhanced peripheral reflex system (PRS) that lets low-power peripherals operate autonomously while the MCU core sleeps, allowing connected devices to sleep longer, thus extending battery life. Energy-saving low active-mode current (63 µA/MHz) enables computationally intensive tasks to execute faster. Low sleep-mode current (1.4 µA down to 30 nA) and ultra-fast wake-up/sleep transitions further minimize energy consumption. Jade and Pearl Gecko MCUs also integrate a high-efficiency DC-DC buck converter. Offering a total current capacity of 200 mA, the on-chip converter can provide a power rail for other system components in addition to powering the MCU. This power management innovation reduces BOM cost and board area by eliminating the need for an external DC-DC converter. Engineering samples of EFM32JG Jade Gecko and EFM32PG Pearl Gecko MCUs are available now in 5 mm × 5 mm QFN32 and 7 mm × 7 mm QFN48 packages. Production quantities are planned for Q2 2016. Jade Gecko pricing begins at $1.24 in 10,000-unit quantities. The Pearl Gecko pricing begins at $1.65 in 10,000-unit quantities. The SLSTK3401A EFM32PG Pearl Gecko Starter Kit costs $29.99. Saelig Company recently announced the MQP Packet-Master USB-PDT all-in-one comprehensive Power Delivery Compliance Tester. Intended for testing protocol, measuring transmitter signal quality, receiver quality and interference rejection, and power load testing, the USB-PDT s a complete compliance tester and development tool for USB power delivery, incorporating analyzer, exerciser, compliance tester, PD VBUS generator, PD VBUS load, VBUS voltage, and current monitor functions. The unit performs comprehensive PHY, protocol and power compliance tests on PD devices, and PHY and protocol tests on PD cable marker chips. The base unit, which incorporates a plug-in module design, comes with GraphicUSB, an easy-use graphical Windows application for driving and reporting on the compliance tests and capturing and displaying every detail of power delivery interactions. “Power Delivery” is a specification allowing USB ports to provide power in a more flexible and adaptable way. The industry standard BMC version uses two-way signaling on the CC wire of a USB C-cable. The Packet-Master USB-PDT behaves as one end of a power delivery link. It can emulate the behavior of an initial Downstream Facing Port (DFP) or Upstream Facing Port (UFP) in controlled ways, and can confirm the responses of the connected Unit Under Test (UUT). It is also designed to perform all the required protocol and PHY Compliance Tests on Electronic Cable Markers. USB-PD connectors can be damaged by handling. If a connector becomes damaged, you can simply replace the plug-in module. The Type-C receptacle on the plug-in is itself a user-replaceable item. Different connector styles are available for USB-PD use. Swapping plug-in modules provides the flexibility required. Designed USB experts MQP Electronics, the USB-PDT will be available from Saelig in Q1 2016. Infineon Technologies expanded its µHVIC family of integrated circuits for high and low voltage. The new IR44252L, IR44272L, and IR44273L single channel low-side drivers enable highly effective design solutions. Using Infineon’s high-voltage junction isolation (HVJI) technology, the small driver ICs are complementary with other µHVIC parts and serve as a viable solution for flexible PCB layouts across a variety platforms. In addition to the tiny SOT23 packages, the drivers feature a wide VCC range of 5 to 20 V, an enable input (IR44272L), and dual output pins (IR44252L and IR44273L). 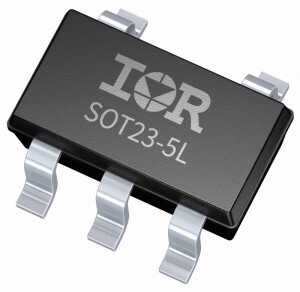 The typical source current and sink current of the IR44252L is specified with 300 and 550 mA, 1.7 A/1.5 A for the IR44272L and IR44273L,respectively. The new low-side drivers offer VCC Under Voltage Lock Out (UVLO) protection and fast switching. Typical turn-on and turn-off propagation delay is 50 ns and typical turn-on rise time and turn-off fall time down to 10 ns (IR44273L and IR44272L). In addition, the new devices are 3.3-V logic compatible and provide CMOS Schmitt-triggered inputs. The seven-device driver IC family offers easy-to-implement building blocks for frequently used circuit elements. Apart from the new low-side drivers, the family includes the IRS25752L, IRS20752L, and IRS10752L (600 V, 200 V and 100 V) single channel high-side drivers and the IRS25751L high-voltage start-up IC (480 V). µHVIC family production samples are now available. In the multipart article series, “The Internet of Things,” Bob Japenga details how to connect simple devices wirelessly to the Internet. This month, he covers at the requirements for, the cost of, and some of the problems with cell modem certification for embedded systems. Almost every month, I get a call from some budding new entrepreneur with a great idea for an Internet of Things (IoT) product. Before we get too far along in the conversation, I ask the question: “What is your budget for cell modem certification?” More often than not, the answer is: “What is that and how much does it cost?” This month I would like to address these two questions as well as address the major issues we have had in cell certification. As always, this is a big topic that we cover in thin slices. All cell modems are required to be certified by cell carriers prior to sale to customers like you and me. However, just because the cell modem is certified for a particular carrier, you are still required to certify the device that incorporates this modem. This makes sense for a lot of the certification requirements. For example, just because the cell modem has an acceptable receiver sensitivity and good robust transmit power, it doesn’t mean that your design has met these requirements. This necessitates that you separately test your device to the carrier’s requirements. The only exception to this is when the cell modem is self-contained and not an integral part of your design. For purposes of brevity, I will only cover the requirements for North America. Nor will I go over definitions defined in previous articles in this series. If your IoT device is going to use AT&T (3G or 4G), you will be required to pass PTCRB and AT&T certification testing. PTCRB (an obsolete acronym that used to stand for PCS Type Certification Review Board) is an independent certification agency used by some North American cell carriers, including AT&T. Testing to the PTCRB standard is done by a third-party independent test lab. You, the designer, are responsible to contract with one of these independent test labs. Cetecom (www.cetecom.com) and 7Layers (http://7layers.com) are two such labs that we have worked with. After you have passed the PTCRB tests, you need to obtain AT&T approval. Once scheduled, PTCRB testing will take three to four weeks. AT&T approval takes another one to two weeks. The lab costs depend on the particular test lab, but it will cost between $20,000 to $40,000 for GSM modems and $60,000 to $70,000 for LTE modems. The process of certification for Verizon 3G (CDMA) and 4G (LTE) is done directly through Verizon. This testing can be done through an independent lab or through Verizon. Verizon recommends that you pre-certify your product through its Innovation Center. There you can work with Verizon test engineers and technicians to make sure your design is ready for prime time before you go to certification. Verizon provides this service to qualified companies. Once you have pre-certified, then you can contract with an outside independent certification lab (e.g., Cetecom, 7Layers, and Intertek). The cost for a CDMA certification will be $15,000 to $20,000 while the LTE certification can cost as much as $70,000. Once scheduled, the pre-certification timeframe is about two to three weeks with another three to four weeks for certification once it is scheduled. If you are deploying a GSM modem on the Aeris network in North America, you will require PTCRB certification as well as Aeris certification. The cost and schedule are the same as I described earlier. If you are deploying a CDMA solution, you only require Aeris certification (which has the least stringent requirements of all the carriers, is free and takes a week or two). Aeris also allows you to self-certify for small volumes of installations. Let’s summarize the technical requirements for certification and our experience with these. Total Isotropic Sensitivity (TIS): All carriers for all radio access technologies require a minimum receiver sensitivity. Basically, this test determines how weak a signal from the cell tower your device can respond to. This is one of the situations where certification is your friend—not your enemy. You don’t want to deploy your great new idea and have a lot of “Can you hear me now?” problems. There are three primary ways that we have improved our TIS. First you must make your device whisper quiet in terms of radiated emissions in and around the receiver frequencies. If you thought meeting FCC Class B EMC requirements were tough, your requirements for making your device whisper quiet to meet the TIS requirements are much more stringent. I’ll talk more about this when I discuss EMC requirements. Finally, your antenna should be placed as far away from any metal as possible and should have a nonmetallic path to the outside world. One product we had was mounted in a large metal base mounted to an outside wall that shadowed the entire hemisphere behind the product. PTCRB testing of this product required it to meet the TIS requirements completely and evenly around the sphere. We could not get the test lab to relax this 360° requirement. Instead we removed the product from its real world enclosure and performed the testing in a nonrealistic environment. This seemed ludicrous to us since we wanted to test it in the real world enclosure. This resulted in uncertainty on our part once the product passed certification. We were not certain how it would work in the real world when it had this metal box shadowing the back hemisphere. Thankfully, we have deployed more than 50,000 of these with no TIS problems. Total Radiated Power (TRP): As with TIS, certification testing is your friend concerning TRP. The carriers have similar stringent requirements for TRP. Here your design must carefully place and tune your antenna to obtain the maximum TRP. A little bit of movement of the antenna can make a significant improvement or degradation of your radiated performance. Another critical requirement for your design is that your power supplies must be capable of instantaneously delivering 1 to 2 A of power when a transmission takes place. Cell modems have one of the more demanding power supply requirements that we have worked with. One design flaw we saw in one design was having the ground plane under the u.fl connector going to the external antenna. This ground plane was absorbing a significant amount of both outgoing (TRP) and incoming radiation (TIS). Your antenna connector must not be near either the ground or power plane. Electromagnetic Compatibility/Electromagnetic Interference (EMC/EMI): We did a preliminary EMC scan on our first IoT cell modem design and were very happy that we met FCC Class B requirements for radiated spurious emissions (EMI) with flying colors. What we didn’t know was that PTCRB had its own idle mode radiated spurious emissions requirements which were far more stringent than FCC Class B. Initially, we were not even close to meeting these PTCRB requirements. We hired an RF expert to help us. His first suggestion was for us to rip apart an old cell phone and tell him what we saw. When we did this, we saw that the entire circuit board was covered with EMI shield cans (see Photo 1). “That’s what you need to do with your design.” So, after designing the circuit with all of the EMI suppression techniques and good layout practices that we knew, we still needed to populate the board with five shield cans. Data Retry: If you were a carrier, you would not want to have devices tie up band width with incessant retries. So each carrier has its own unique retry requirements. Some of this retry logic is handled by your cell modem (retries connecting to the cell tower). But in addition, your application software must meet the retry requirements of each carrier. Generally, we are designing systems that use less than 1 MB of data every month so we don’t want too many retries at the application level either. Data Throughput: Remembering that carriers are trying to get as much data through as quickly as possible, each carrier has data throughput requirements for some radio access technologies. This requirement is strictly a function of your cell modem chip. Since your chip is already certified for the particular carrier, it has already passed these tests. Unfortunately, some carriers require you to retest many of these requirements that have absolutely no bearing on your design unless you have modified the cell modem chip (which you can do). It is understandable that the carriers need to protect their network from rogue devices but I feel very strongly that they need to simplify this area of certification. So chip makers, carriers, and PTCRB board, if you are listening, isn’t there a better way to detect if we have modified the chip’s operation? For example, if there was a flag in the chip that indicated that the radio parameters have been altered in such a way that the carrier/PTCRB certification has been compromised, certification could be made much simpler. A lot of these tests are very complicated and are being performed to moving standards. We were certifying one product that was failing tests that had nothing to do with our design—only with the cell modem chip. What it boiled down to was this: The chip was tested and passed Version A certification requirements. More stringent requirements were created later (Version B) which our modem failed. Since we were only required to pass Version A requirements, we should have been able to re-run the tests to Version A. The problem was that the certification lab did not have test equipment that ran Version A tests! Hopefully you see the problem. I strongly think this must change as it wastes a lot of time and money in the certification process. We have wasted several months trying to get this device ready for sale. In 2010, I was at a football game with my grandsons and 103,000 other people. One of my grandsons was not able to make the game, so I wanted to send him a text at kickoff. Even though I had maximum signal strength, I could not make the call. When I looked around the stadium, it was clear that many wanted to text or call at the same time. Cell phones must work in close proximity to other cell phones. Most M2M devices do not have that requirement. PTCRB certification requires that your device not be transmitting on any frequencies other than the frequency you are licensed to transmit on so as to avoid interfering with nearby cell phones. The first device we took through PTCRB testing failed these tests at a couple of points. What we discovered was that every diode in your design acts as a re-radiator of the radio signal you are transmitting. And it radiates at one of the harmonics of the transmit frequency. This must be squelched or you will fail your Harmonic Radiated Spurious Emissions (RSE) tests. Even after doing another spin of the board with small capacitors around every diode, we were still failing Harmonic RSE at a couple of frequencies by a few decibels. The product was already several months late. Should we do another spin of the board after we find the diode we missed? At this point, I pushed through a waiver. This was a formal request to the PTCRB board for an exception to the requirements. Our unit was stationary. Our unit did not operate in the presence of other cell phones. Come on, we are talking about only 2 db! Thankfully and quickly, the waiver got approved. We had our first cell modem-based IoT device ready to ship. So the moral of the story is: Work with the certifying agency. Some requirements that apply to cell phones do not apply to M2M products. Sometimes the certification process is our friend but a lot of time it is just a pain in the neck. You have a good IoT idea that will make this world a better place. But before you bring it to fruition, you will need to pass the necessary certification tests imposed on you by the cell network carriers. This article gives you a thin slice as to what’s involved and what it will cost. This article appears in Circuit Cellar 305, 2015.